Another book in my favourite genre this year, post-apocalyptic fiction. Why am I reading so many of these? Are there just more around? Do they just suit the end-of-the-world mood I seem to be feeling every time I watch the news? In any case, I've found quite a few this year and they've all had their appeal. 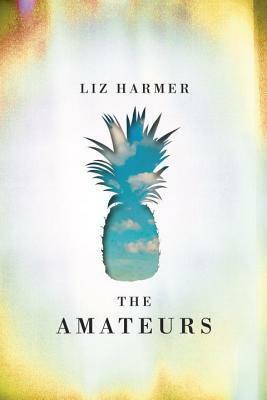 The Amateurs is a quieter apocalypse - no pandemic, no climate disaster, but even more frightening for its dailiness - massive tech firm PINA has created Ports. The Ports allow for nostalgic or adventurous daydreamers to travel through time: step through a Port and you will end up in the place you are dreaming of. The problem is that people are stepping through, and never coming back. Turns out that the technology isn't as bug-free as promised, and the creators don't actually know how it works, except that Port seems to be alive, and enticing people into stepping through to a new life. Why, and how? That's the question among those left behind in a tiny population decimated by mass disappearances. The story focuses on Marie, an artist in her 30s who is convinced that her ex-husband will return from the other side of PORT, and find her again. She still lives in her small apartment over her art store in Hamilton, even while the other 40-some people left around are rehoming themselves in the huge expensive mansions now left empty. They all gather daily at a local church though, keeping track of one another and their survival. The problem is, they are all amateurs -- they have no doctors, no engineers, no farmers. And winter is coming around again. Do they stay, connected to their city, or leave for warmer climes? It's a constant thread. There's also another settlement across the continent, the fancy complex that houses PINA and its eccentric founder, Albrecht Doors. For some reason he never used his own Port technology, and now there is a circle of 100 or so PINA employees living in the compound with him. Brandon, his right-hand man, is beginning to have doubts about Doors' brilliance; he steals an electric car and heads cross-country to Hamilton to see if his mother is still on this side. There he meets Marie and her gang of survivors. The story has a great premise. And it's told well, with smooth and appealing writing. It has the feel of Station Eleven in its quietness and look at art and what makes life worth living. Where I felt it was a bit weaker is in its tendency to explain and set the scene, a lot, rather than get the action moving. It builds up Marie's obsession with ex-husband Jason, but when the crisis comes he seems to be an afterthought in the end. The end of the book is also unresolved, as if the story hasn't been carried to any conclusion. I found it really unsettling in a way that was slightly different from other books of this kind. It seems like the world is ending with a whimper, not a bang. The people we meet don't seem to have many practical survival skills, and I don't feel too much hope for them. Or from them, for that matter. The undertone of the book seems to be one of helplessness, of powerlessness in the face of this disaster, of a cosmic shrug instead of a sense of humanity gathering together in our urge to continue on. I think that was what was most striking about the mood of the book - I really believed after closing this that humanity was simply going to die out, without much more fuss. A hint toward the future or toward something positive, a sense of the potential of the new order, or something along those lines would have changed the impression I had of this book's pessimistic outlook. But that could be just my take - have you read it? What were your impressions of the zeitgeist of the story? Did you like it/dislike it/enjoy it/fling it across the room?